Wine Poached Pears in Chocolate Sauce! The perfect healthy recipe for fall! The perfect dessert to pair with a heavier meal. 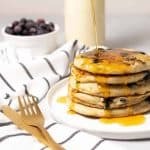 Gluten-free, vegan, and low-fat! Boozy Pears! I heart any recipe that requires me to use a few cups of red wine. TGIF. A few weeks ago, BL and I were dining at one of my favorite Sacramento restaurants, Blackbird. Since we do go out to eat fairly often, I try to stick to choosing either an appetizer or a dessert so I can enjoy my entree without guilt. That way, I’m not too tempted to overeat. Of course try is the operative word here. Sometimes, we throw caution to the wind and order it all. Which is exactly what happened at Blackbird, as I attacked a beet salad appetizer plus a giant vegan burger and fries. But, once I scanned the dessert menu and saw this poached pear, I immediately knew we weren’t leaving without a taste. I’m so happy I made room for a few bites as this did not disappoint. So, like I do with 94% of the meals I try while dining out, I went home to recreate this one with my own twist. If you haven’t tried poached pears before, it’s much easier than it looks! Since it can be made a day ahead, it’s also a great dessert option for a dinner party. If you’re looking for an alternative to heavy pies for Thanksgiving, try this light poached pear recipe! To make them easier to serve, I slice a thin 1/4″ piece off the bottom of the pear. That way, if I want to serve them standing up for the most dramatic presentation- they won’t fall. Then, peel as much skin as you can, keeping the stem intact. While plain red wine will work fine, I like to add a little holiday spice by adding in orange juice and cinnamon. The liquid reminds me of mulled wine and is perfect if you want to try these for Thanksgiving or Christmas. Bring the wine-orange-cinnamon mixture to a simmer, add the pears, poach for 20 minutes and you’re done! Fresh pear season is underway, with all 10 varieties of USA Pears being harvested now. To me, just-ripe pears work best in this dish, although under-ripe pears work as well. To see if a pear is ripe, apply gentle pressure to the narrow “neck” of the pear with your thumb. If it yields to pressure, it’s ripe! If you are using an under-ripe pear, cook for another 5-10 minutes in the liquid. 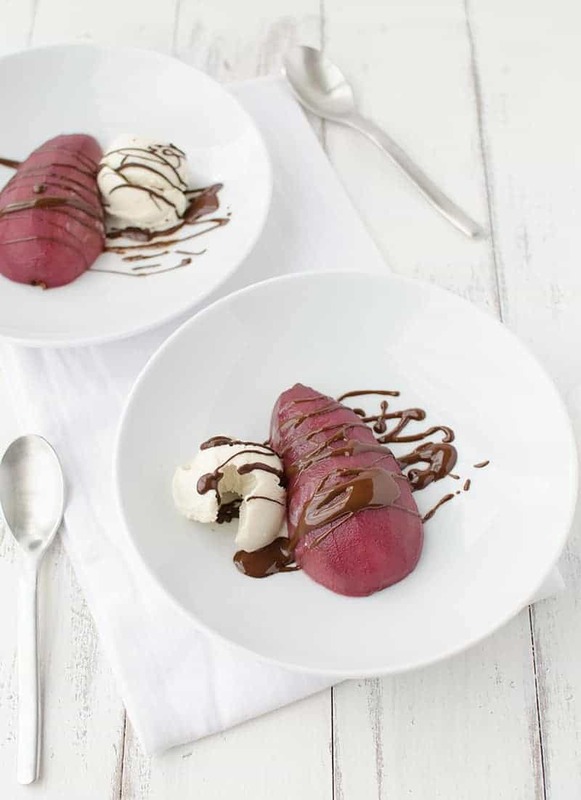 I love the look of wine poached pears, especially drizzled with chocolate sauce! Not a wine fan? Pretty much any liquid works. This same process can be used with tea, bourbon, coconut milk, beer or coffee. While I think the chocolate sauce is a must, you can also boil down the poaching liquid to make a rich, cinnamon-wine sauce to be poured over the pears for serving. 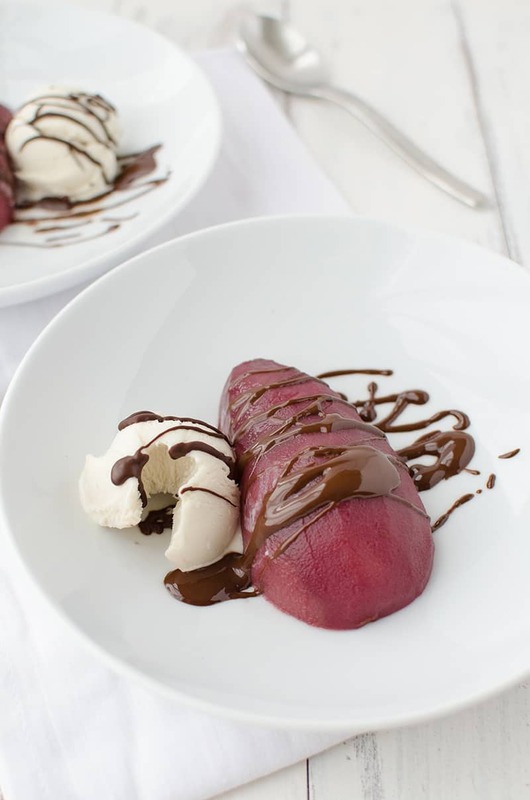 Wine Poached Pears in Chocolate Sauce! The perfect healthy recipe for fall! 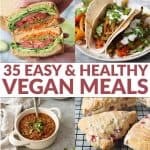 Gluten-free, vegan, and low-fat! Peel the pears, leaving the skin intact. Slice 1/4 inch off the bottom of the pears so they can stand flat. Place the pears in a saucepan and cover with red wine, orange juice, and cinnamon sticks. Bring to a simmer and cook for 20 minutes, rotating if need be to submerge in the liquid. Remove the pears from the liquid and let cool for at least 2 hours in the fridge. Combine the chocolate chips and coconut oil in a small saucepan over low heat. Continuously stir until chocolate is melted. To serve, 1/2 the pears and place onto a plate. Drizzle with chocolate sauce. Aren’t poached pears SO good? I made an apple cider version for this campaign and LOVED them! Oh… that sounds awesome!! Can’t wait to check your version out! Need these in my life. They sound incredible. You’ve also reminded me how excited I am for mulled wine season. Yay! So happy to hear! 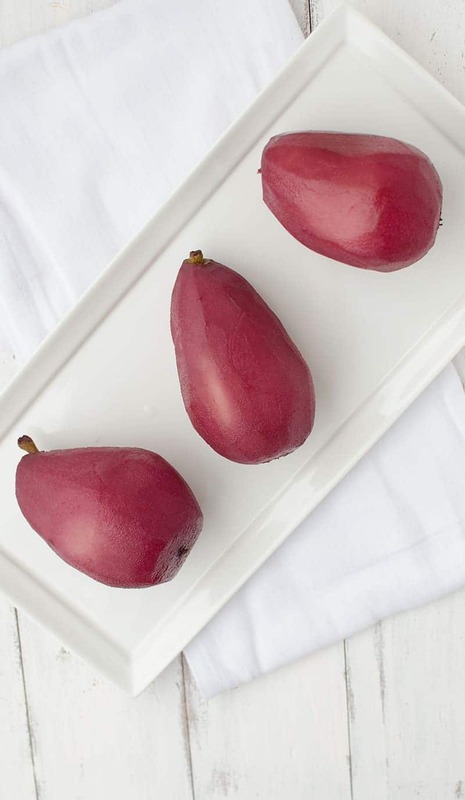 These taste like MULLED WINE poached pears- and they are incredible! Thanks for commenting! This is THE classiest dish I have ever seen! They are gorgeous, Alex! Wow these looks delicious Alex. Not only does the flavor sound amazing but the presentation looks incredible, , it would be great for any guests!